German police have come to the rescue of a man being chased by a baby squirrel. Officers in the south-western city of Karlsruhe responded to the call for help and arrived to see the creature still terrorising the caller. 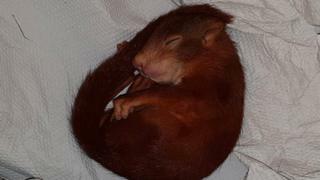 The squirrel was taken into custody after it abruptly fell asleep. A police report of the incident say the persistent rodent has become their new mascot, and has been dubbed Karl-Friedrich. According to the report, baby Karl-Friedrich is being well looked after in an animal rescue centre. Karlsruhe police posted a tweet about the case on Thursday, with more photos of the offender. Police spokeswoman Christina Krenz told the Guardian squirrels that have lost their mothers can focus their attention on one person as a replacement. “It can be pretty scary,” she said, determining that the caller “was certainly feeling a bit threatened”. Squirrel attacks are not always so benign. In July last year, New York authorities warned Prospect Park visitors to avoid an “unusually aggressive” squirrel who attacked five people in the space of one week. A three-year-old boy in Cornwall, UK was left covered in blood the previous year after being bitten by a pack of six squirrels.